Ever since Tuesday I have been unaccountably happy. Maybe it’s because I’ve been getting out regularly or because I’ve getting a lot more long-chain omega-3 fatty acids from fish (and a lot less omega-6) or because of the 10,000 IU of vitamin D I take every day. They each are supposed to counteract depression. My greater happiness has become a virtuous circle. Because I’m happier, I listen to my favorite music much more. When I’m home, iTunes is on almost all the time. When I’ve driving, I listen to my iPod connected to my SUV’s speakers. Being happier, I meditate more, which makes me happier still. Months ago I bought Shinzen Young’s recording of his “Five Classic Meditations: Mantra, Vipassana, Karma Yoga, Loving Kindness, Kabbalah.” He teaches Vipassana meditation, the path that I have been following this year. But with my present good cheer I naturally gravitated this week to his teaching of Loving-Kindness or Metta meditation. As Shinzen describes it, a way to start is to envision myself smiling not only with my mouth and face but also with my whole body and smiling at everyone I see. That may bring a little happiness to them, and it certainly brings a lot of it to me. My 12-day trip to Southwestern Colorado took a strange twist a week ago when I had an emergency operation in Durango, 500 miles from home. The operation went well and the hospital discharged me on Sunday. But I was stranded in Durango. Traveling alone, I checked into a motel as I tried to figure out a way to return home. The surgeon strongly recommended against my driving back. The main reason was that if I had to hit the brake hard, I could tear open the six inch incision in my stomach. But the surgeon offered an inspired suggestion. “You can probably find someone on Craig’s List who wants to share a ride from Durango to the Denver area,” he told me. My photography and hiking vacation in Southwestern Colorado took an acute twist last night. I ended up in Durango’s Mercy Regional Medical Center for an emergency operation. After two and one-half great days in Mesa Verde National Park, I drove 30 miles to Durango. My plan had been to finish my vacation with a 90- mile round trip from Durango to Silverton on the Durango & Silverton Narrow Gauge Railroad. 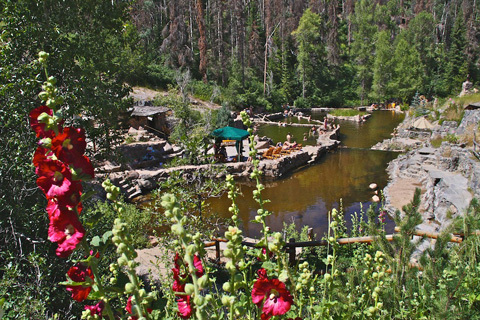 The train has been in continuous operation for 127 years through spectacular mountain scenery. I even bought a ticket to go Deluxe Class from 9 this morning to 6 this evening. I also got a room in a Durango motel for last night and tonight. A few days ago when John mentiond that he knew a Methodist missionary couple in Nome, I said that I wanted to visit them. Today he set up the trip. 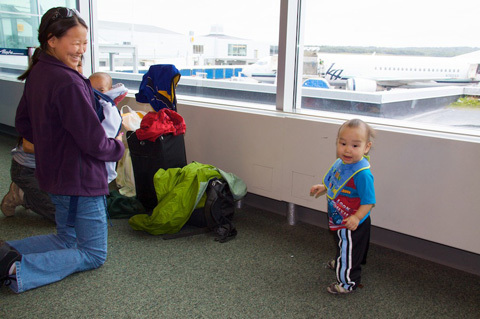 Since he needed to deal with some pressing issues at his church in Anchorage, I flew without him to Nome. This morning John suggested that I make the reservations in hopes that later in the day he could reach the pastors in Nome, Julie and David Elmore. He did contact them today, and they immediately said that they could put me up on an air mattress in the church and loan me a car. Because of the death of one of their congregation, they already had a lot on their plate, but they gave me a great welcome. John asked me to write up and photograph what Julie and David are doing because John’s congregation provides some of the support for the Nome church. He also got his church to pay about half of my plane ticket on Alaska Airlines from Anchorage to Nome. About lunch time today I looked out the kitchen window of John’s condo. Just across the road I saw a mother moose and her two calves feeding on the neighbor’s trees. Of course, I went right out to shoot them. 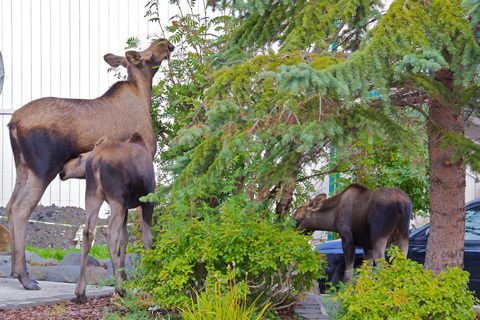 I am beginning to understand why people here in Anchorage aren’t as fond of moose as I am. Except for dinner. John cooked moose steaks for us last night. Delicious and low fat. Yesterday’s rain cleared the atmosphere in Anchorage so much today that we had a rare view of Denali. 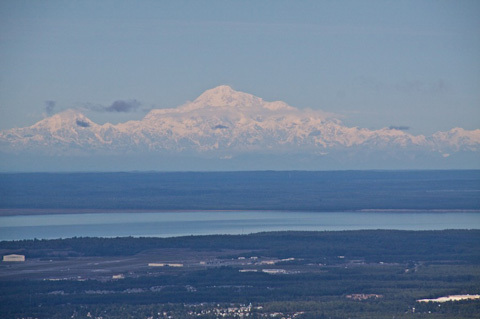 At 20,320 feet, Denali or Mount McKinley is the highest mountain in North America. It is 158 miles from Anchorage. Late last night after a 14-hour drive I returned home from Yellowstone National Park, which I had never experienced before. The world’s first national park, Yellowstone is in the northwest corner of Wyoming and a couple of strips of Montana and Idaho. My month-long trip took me 3,600 miles to experience three wilderness areas and three national parks. On my way back from my High Sierra trek I stopped once in each of the four states en route, Nevada, Idaho, Montana, and Wyoming. My stop in Wyoming was the greatest en route back from California. It fulfilled the three wishes for experiences I hoped to have in Yellowstone. The easiest wish to fulfill was to be able to stay and eat at Old Faithful Inn, a historic rustic-style lodge right next to the world famous Old Faithful Geyser. 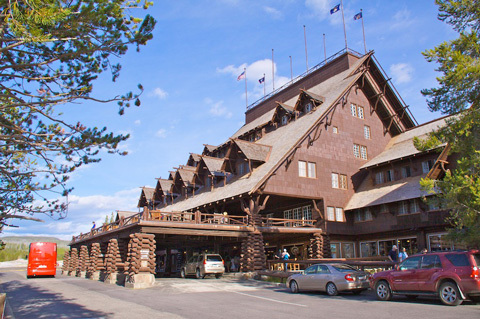 Completed in 1904, the Inn is either the largest or second largest log building in the world and uses lodgepole pine and rhyolite stone. Architect Robert Reamer designed the hotel asymmetrically to reflect the chaos of nature. Until this afternoon I thought that I had already seen essentially all of the world’s great museums. Like the Metropolitan Museum of Art and the American Museum of Natural History in New York, the National Gallery of Art and the Smithsonian Institution in Washington, the Louvre in Paris, and the British Museum in London. That’s why after spending hours in these museum giants I seldom visit museums any more. I am sure glad that I made an exception this afternoon by visiting the Harrah collection at the National Automobile Museum in Reno. All the famous nameplates of yesterday and today are here — and a lot more. I saw dozens of makes that I never heard of before. 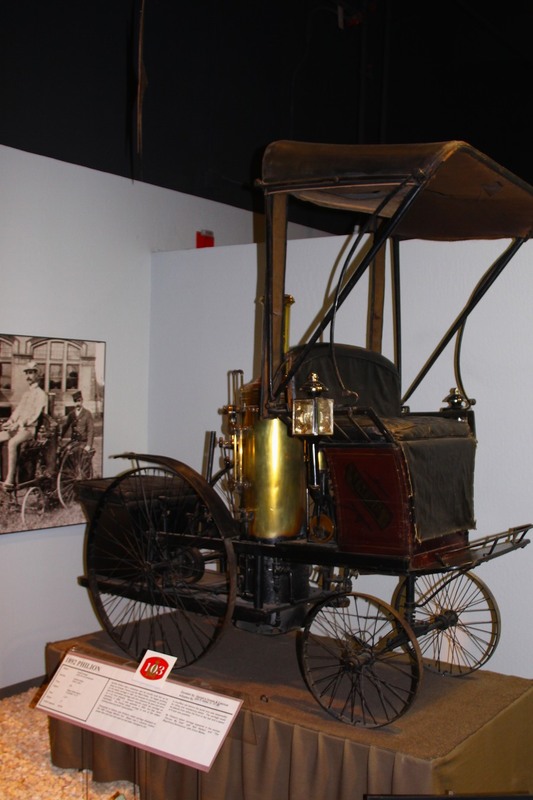 Like this 1892 Philion manufactured in Akron, Ohio. This was the only vehicle that company produced. Who would have imagined that sedate old David Mendosa would some day race at the Bonneville Speedway! Well, he did, and that day was today. 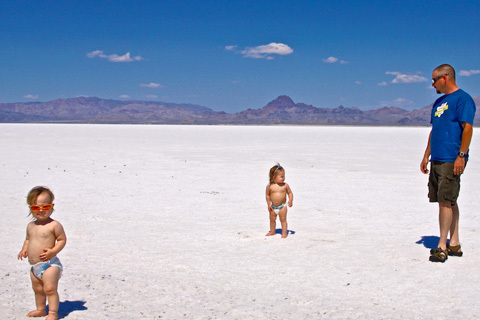 He didn’t challenge the Bonneville Salt Flats record of 630.389 miles per hour that Gary Gabelich set in October 1970. But he did achieve a personal best of 101 miles per hour in his unmodified 2003 Toyota Highlander SUV “Susie.” Actually, Susie could have gone even faster. But David chickened out, remembering when at age 16 he got his first car, a 1941 Buick. The first time he ever raced it he blew a rod. This newly minted speed demon would have never even considered racing on the speedway at the Bonneville Salt Flats if he hadn’t encountered a family from Glenwood Springs, Colorado, at the Bonneville Salt Flats rest stop off Interstate 80. The young father told him that at the very next highway exit he could drive right out onto the speedway. “It’s a lot of fun,” the father of the twins told David, “but I got turned around on the way back.” David thought that with his good sense of direction that couldn’t happen to him. When I wrote my friend Barry from Steamboat Springs on Saturday night, he wrote right back. I told him that I had intended to go that night, but I was too tired after hosting our diabetes support group that morning and driving 270 miles from Boulder that afternoon. I counted at least six pools. The pool temperature ranges from about 50 degrees to 104 degrees. Most people soaked in the two hottest pools, which is where I stayed most of the time. But the coolest pool is great for cooling off. Strawberry Hot Springs is the best combination of natural and developed I’ve ever seen, and I pride myself on being something of a connoisseur of hot springs. With constantly fresh flowing water and no chlorine, I didn’t need a shower afterwards. The bottoms of the pools are clean sand, and steps with railings got me in and out safely. 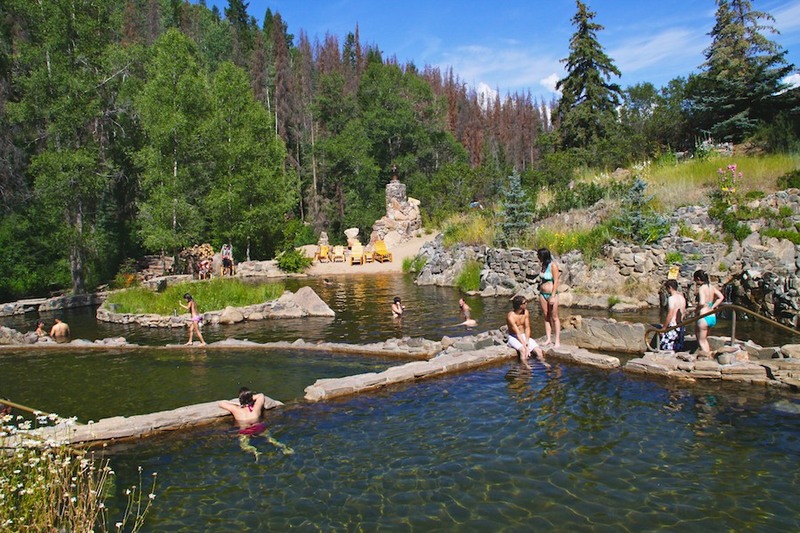 Soaking in these hot springs was one of the main reasons why I took this route through northwest Colorado rather than the faster but boring route through Wyoming that I had intended to drive until a couple of days before I left. I am en route to California where I plan on a two-week hike through the high Sierras with a small Sierra Club group. Aside from the location, a big attraction of that hike is that we will have mules to carry our loads except what we will need on the trail each day.